Possible QL movie by Deborah Pratt - she needs YOUR opinion! What ever Happened to the Girl That played her originally??? How old is she now? Probably around Mandy Moore age. Anyway,the last time i checked she didn't act for a while,so it seems. Maybe she decided to give up her acting career. Soooooo why hasnt anybody thought about Chelsey Bakula to play Sammy Jo??? id love to see that!! 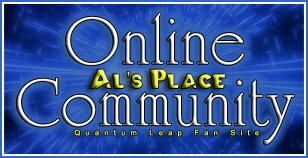 I have found a backer for the "Quantum Leap: Time Child" feature film and we are in negotiations for rights. I am also working on a novel version I hope I can debut at the convention. My second book is coming out and I am doing a sneak peak at Comic Con if any one will be there. Please visit "The Vision Quest" (website) www.thevisionquest.com. I will set up a special LEAPER price when we do the pre order page for Book 2 "The Odyssey" with a 10% discount. You guys bought your convention tickets yet? Do know if Jen Garner is her final decision for Sammy-Jo or she reconsidered it?! She does want Jennifer Garner! And as her hologram?... Queen Latifa! Neither has signed or anything like that as far as I know, but I like that pairing. I can definately see it. What about Al??? Will Dean be in the movie?? She is going back to get her father - so she need Al/Ziggy and maybe even Gooshie. May i ask you to suggest something to Deborah?! Tell her,that I ,for example, would like to see one of Al's daughter as the observer/Hologram. I am almost positive she has already decided on who is going to be Sammi Jo's hologram, sorry. I am sure she's going to stick with canon, keeping the show as it was and not changing things like you see sometimes. This sounds interesting and exciting! But had hopes dashed way too many times. I honestly have to say that the notion of anyone but Melora Hardin playing Sammy Jo is as ludicrous as getting say, Don Johnson, to play Sam in a future Quantum Leap story. Forget about stupid "this iz teh cool" ideas with casting- too many franchises out there have being ruined by talentless hacks butchering franchises out of some lust for epic shinyness rather than being commited to faithfully respecting the mythos of the franchise (Michael Bay, and Transformers being the most recent examples of this). The fact is that having the same actor playing Sammy Jo and Abigail, essentially means that Abigail will wind up being a dead ringer for her mother. This is pretty much established. Having Melora Hardin play someone slightly younger than herself also isn't a stretch. Heck half of the cast of Beverley Hills 90210 were in their late 20s and early 30s playing teenagers and that's just one example of many. Seriously, with the number of hackjobs out there, do we really need one more 80s franchise having the soul sucked out of it through unfaithful artistic representations? If they don't want Melora Hardin (or if she's not up for taking on the role), I'd love to see Kimberly Cullum do it, since she played Abigail & Sammy Jo as kids. Kimberly Cullum is too young for playing Sammy Jo in "the present" of QL. It should be noted that this is an old thread. Deborah Pratt has said that the project has been canceled. Well it doesn't mean we can't come back to it from time to time.